All shipments are operated by registered priority mail. if you want it to be shipped unregistered and/or economic, ask for details. ATTENTION: in case your order does not arrive in more than 7-10 days [Europe], 14-20 days [overseas], don't panic and/or blame me for bad work. I do ship by recommended airmail - as fast as possible, and delay in your order's delivery is caused by nothing else but international postal systems. I take NO reponsibility of factory damaged items, i.e. those that come from labels and distros sealed. It is customer who takes the risk, so NO demand to return money back will be satisfied in such a case. Shipping costs are to the buyer's account. Insured DHL with tracking worldwide would be 25 Euro ex South Africa. > I want my buyers to be fully satisfied and I work for that. But if I have not met your expectations, please do send the goods back and you will be refunded for the price of the item but not the shipping price. > Payments must be received within 4 days otherwise, the order will be canceled. > I cannot be responsible for items delivered broken or in not usable conditions. Also for packages lost or missed by postal service mistakes. > Buyers are responsible for paying shipping fees. > Discounts given on purchases of multiple items per order. Feel free to ask. Thanks for visiting my Vinylom store. Bell,Beckie - Let Me Know - 12"
* 2 LP Set Counts as 2 Items, 3 LP Set Counts as 3 Items, etc., Additional Charges Apply. * Additional Charges Apply AFTER The Equivalent of Two Items. * U.S.A. $3.00 USD Extra for Each Additional LP Record or Item AFTER Two. * Canada $5.00 USD Extra for Each Additional LP Record or Item AFTER Two. * Mexico $6.00 USD Extra for Each Additional LP Record or Item AFTER Two. * Europe $7.00 USD Extra for Each Additional LP Record or Item AFTER Two. 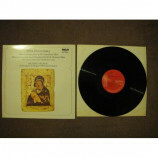 * Australia or Asia $9.00 USD Extra for Each Additional LP Record or Item AFTER Two. * South America $9.00 USD Extra for Each Additional LP Record or Item AFTER Two. * Shipping Costs of Multiple Items will be quoted at time of order in a separate email. * Initial USPS Priority Mail Shipping Insurance Covers Up To $50.00 and USPS Priority Mail Express International Shipping Insurance Covers Up To $200.00 when first choosing your shipping option. If you choose to insure more expensive items, we will email you with the extra cost of the insurance adjustment. WILL QUOTE AT TIME OF ORDER . ***** IF WE DO NOT RECEIVE PAYMENT OR RESPONSE WITHIN 5 BUSINESS DAYS WE WILL CANCEL UNPAID ORDERS . We highly recommend insuring your shipment/order/items, we are not responsible for your shipment/order/items after it leaves our location. Packages are shipped USPS Priority Mail guaranteed to arrive in 2 to 4 days in the USA, USPS Priority Mail Express International guaranteed to arrive in 7 to 10 days ? out of the USA most locations Worldwide International, and is handled with extreme care. We have never had a problem shipping this way. If a buyer would prefer another method of shipping large orders, we will work with you. Please email or call to discuss an alternate shipping method for large orders. Shipping of large orders will be quoted at time of order. We also ship to Canada, Mexico, Europe and most other countries (in some cases we will quote current shipping charges at time of order). We require Registered Mail for some countries due to their postal system. All destinations outside USA shipped via USPS Priority Mail Express International based on size of order and appropriate insurance. Will be in contact by email. Orders are usually shipped within 72 hours of receiving full payment. * Automatic Discounts given on purchases of 10 or more items ordered and placed at same time. * NOT TO BE COMBINED WITH OTHER DISCOUNTS OR DISCOUNT PROGRAMS. Lost or damaged items are not our responsibility, once it leaves our location. We highly recommend the buyer insuring all items/orders/shipments so the buyer has some recourse in case an item is lost or damaged in transit. A return will only be granted and total refund given if the item purchased is not as described in our Original Posted/Listed Described Condition or the wrong item is shipped (very strict, conservative grading of items). Very well researched, complete, accurate descriptions of all items posted/listed online. All Items Double Checked for Accuracy Before Being Shipped. All Items Must Be returned in the Original Posted/Listed Described Condition. Due to Most or All of our Posted/Listed STILL SEALED or FACTORY SEALED Inventory Items in Sealed Original Factory Shrinkwrap being Out Of Print New Old Stock, All STILL SEALED Items in Sealed Original Factory Shrinkwrap Must Be returned in the Original Posted/Listed Described Condition, STILL SEALED in Sealed Original Factory Shrinkwrap. Contact us by email first to get authorization for return of item. Do Not Return Any Items Without Authorization! If we make a mistake, we pay for return of item. If you make a mistake, you pay for return of item. Sounds Fair! Remember, Do Not Return Any Items Without Getting Authorization! All Items Listed Are In Stock. No Backordered Items! Grading based on Goldmine Standards but expanded to the 10 Point Number grading system for more accuracy for Cover (Record Jacket) and Record (Vinyl) condition. Condition of Cover (Record Jacket) reported first then Record (Vinyl) reported second ( example: Cover/Record = Cvr 7/9 Rec means that the Cover is in Very Good (7) Condition / the Record is in Near Mint (9) Condition ). Very strict, very conservative with grading system. All Items VISUALLY GRADED unless Item Description states PLAY GRADED in the Description. * NOTICE: An Item must be STILL SEALED/ Never Opened to receive a Grade of 10 or NEW or MINT Condition! Clean = NO dust, dirt, grime, stains or residue of any kind. Glossy = Original shine or lustre of item, NO hazing, whiteing, corrosion or oxidation, NO heavy groove wear on vinyl. Hairlines = Very light but visible lines can be from slipping vinyl in and out of sleeve, jacket or cover. Scuffs = Very light but visible rubs or marks can be from slipping vinyl in and out of sleeve, jacket or cover. CASSETTES and CDs: As a general rule, Cassettes and CDs should play perfectly, in which case they are in Like New, New or Mint condition. Cassette tape can deteriorate with age and other factors, even if it remains unplayed, so care should be taken when buying unsealed, open, used old tapes. CDs are difficult to grade visually, they can look perfect but actually be faulty, while in other cases they may appear damaged but still play perfectly. Cassette and CD inlays and booklets should be graded in the same way as record covers and sleeves. Generally, the plastic cases for Cassettes and CDs can easily be replaced if they are broken, cracked or scratched, but card covers and digipaks are subject to the same wear as record sleeves. Mud - Lean On Me - 7"
Gracious - Gracious ! / This Is . . . Gracious !! USA: starting at $3.32 (for a single album), $3.82 (for two albums or a double album), etc. For others, please ask an I'll check the rates according to the total weight. Money Orders or Casier's Checks are fine, but I'll need to make sure they clear before I send your records. If you are local to the Maryland/DC (USA) area, a pick up can be arranged and no shipping costs will be charged. Metallica - No Life 'Til Leather/ cass demo "RARE"